Gustavo Dudamel is a 26-year-old conductor who has literally set ablaze the latest classical music interpretations with his astounding talent. His precociousness in attaining so much popularity in so little time is comparable to the rise of famous pop-stars. This incandescent music conductor was introduced to music at a very early age when listening his father play the trombone. Later, his passion increased to the point in which music became omnipresent in his life. As a matter of fact, he declared in a recent interview: "I started playing violin at 11, late. But I always wanted to conduct. I used to 'direct' at home using toys". Dudamel was first proposed to direct the National Youth Orchestra at the age of 15 by José Antonio Abreu. 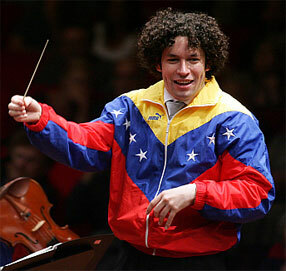 Before he turned 20, Dudamel was already touring Europe and directing both Youth and Adult Simon Bolivar Orchestra. Since then, his career prospects flourished. His stick technique is characterized by magic vibrancy and cheery exuberance. Simon Rattle, one of Dudamel’s mentors refers to him as: “the most astonishingly gifted conductor I have ever come across”. Furthermore, both Claudio Abbado and Daniel Barenboim deem him as being a conductor of a unique and superior kind. A fit young man, Gustavo Dudamel has a gift for communicating simultaneously to both the orchestra and the audience. He is able to wonderfully conduct a wide range of emotions in music; from Shostakovich’s 10th caustic violins, up to the most frail clarinet melody. His conducting style is constituted by all of the Latino energetic swing, and European delicate grace. Born in a poor Venezuelan barrio, Dudamel states: “Some of the people I grew up with are now in drugs and crime; I’ve always had the orchestra as the centre of my life”. If the music community has helped Dudamel in rescuing him from a disadvantageous future, this young conductor has given even more to the music world. Above all, Gustavo Dudamel’s inspiring story has a relevant social factor. Coming from a poor background, this greatly talented Venezuelan conductor teaches an extremely important lesson on how music can positively shape a person’s life. The Simon Bolivar Youth Orchestra which he conducts is constituted by musicians aged 12 to 26. Music saved these young performers from the deleterious environment of Venezuelan barrios. One of them says: “They have told us who Mozart and Beethoven were, that they could be ours and give us an escape”. As a matter of fact, Venezuelan government has instituted Fundación del Estado para el Sistema de Orquesta Juvenil e Infantil de Venezuela (Fesojiv) to promote music in poor socio-economic neighbourhoods. Fesojiv’s main goal is not that of training students to become professional musicians, but that of rescuing them from abusing families and/or abject poverty. One of the students briefly explains his story: “At first, I thought they were joking. I thought nobody would trust a kid like me not to steal an instrument like that [a clarinet]. But then I realized that they were not lending it to me. They were giving it to me. And it felt much better in my hands than a gun”. Therefore Fesojiv offers not only a high music education, but a second opportunity to all those people willing to accept it - as Dudamel did. The importance that Gustavo Dudamel’s story exemplifies is not to be underestimated. With time, classical music’s glamour has slowly deteriorated (refer to Where is Classical Music Going? in the blog section). As a consequence the average age of listeners has inevitably increased. This might be the turning point in which teenagers are thoroughly introduced in the realm of classical music, and are taught how to fully appreciate this art. Dudamel’s energetic conducting has already drawn 240,000 young Venezuelans to classical music, and might attract many more. A natural consequence would be asking oneself: is classical music renovating itself? Will its “crisis” be stopped? Incorporating young performers and conductors may be the brightest marketing move after the 80’s MozartMania.